(Bavaria, The Kingdom.) With title + signs and symbols cartouches and miles indicator. 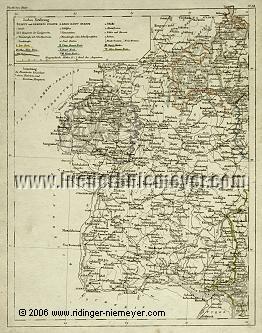 Detail map by Friedrich Wilhelm Streit (Ronneburg, Thuringia, 1772 – Berlin 1839) in steel engraving coloured in outline. 2 sheet. (1834.) 11 × 8¾ in (28.1 × 22.1 cm) each. With the postal relations distinguished by normal and express service and further details more. Under framing-ready shared passepartout with center strip . Center of the western sheet Stuttgart. 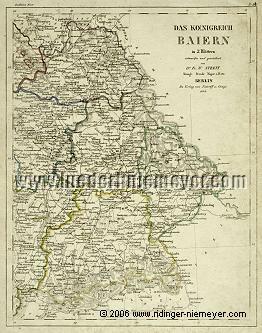 – This up to Rüdesheim – Frankfort/Main – Grünberg – Fulda – Tann – Dinkelsbühl – Sonthofen – Feldkirch – Constance – Basle – Saargemünd , the eastern sheet up to Saalburg – Plauen – Eger – Eferding, Danube – Salzburg – Innsbruck – Dillingen – Windsheim – Henneberg . – Margin slightly foxing.